Here is an awesome discussion about an important topic: public trust. There is an increase of trust﻿ combined with gullibility caused by a fragmentation of trust. People trust others like themselves which is a reaction to modern multiculturalism and conflict of identity groups. Also, mistrust has increased because knowledge has increased. The national media informs people of all the bad things all over the world like never before… which has happened simultaneously as local media reporting on communities has decreased. Many people (especially the older generations) would like to return to the simplicity and ignorance of the past, but the younger generations are more embracing of a complex world.﻿ I’ve seen polls that show younger people are less mistrusting of the media and the government. The younger generations are used to dealing with diverse sources of info and used to determining which info is trustworthy. One possible solution is finding a new shared culture that will allow for social cohesion that will bridge the diversity between cultures, between communities, between generations. Et Cetera. There was a central factor not brought up by﻿ anyone in this video. High wealth disparity correlates to high rates﻿ of social problems (including growing mistrust). Wealth disparity has been increasing in the US for decades and is at a high point not seen for a century. Accordingly, the US rate of social problems has increased above other countries with lower wealth disparity. I just thought of another possible factor: Mean World Syndrome. One example of this is research showing most people (specifically in crowded cities) will walk past someone who is injured or unconscious. People don’t trust others and they realize others don’t trust them. In such mistrust, it’s a major risk to get involved in someone else’s problems or to take responsibility for public problems. This relates to something brought up in the above video. One of the panelists said that when everyone is seeking to blame the other side neither side is willing to take responsibility. One last point. Distinctions should be made. Even though the (possible) loss of trust has impacted everyone, it’s impact has been different in kind and degree for various demographics. I wanted to post this because the analysis does two things. First, the author concludes that the legalization of abortion was the greatest cause behind the vast decrease in crime rates. This is a different conclusion than what other research has shown (see previous post: Jimmy Carter & Clean Air Act). According to that other research, it was the reduction of lead through federal regulation that had the strongest correlation to the decreasing crime rates. This brings me to the second point. Maybe both are correct. It wouldn’t be surprising that there was more than one major contributing factor to this change. Either way, it supports my analysis from the previous post linked above. Both the FDA and abortion legalization are central victories of the progressive agenda. More importantly, those weren’t just victories for progressives. In terms of real world results, they were victories for all Americans. So, why do conservatives remain critical of these types of policies that have proven to work and proven to benefit society? Compare this to a favorite conservative policy such as the War on Drugs. Since the beginning of the War on Drugs, the rate of drug use has increased. The War on Drugs has been a part of the larger conservative policy of being tough on crime. The creating of the prison-industrial complex has led to (according to the U.S. Bureau of Justice Statistics ): “In 2008, over 7.3 million people were on probation, in jail or prison, or on parole at year-end — 3.2% of all U.S. adult residents or 1 in every 31 adults.” All of those people in prison (all those lives disrupted and all those families destroyed) wasn’t even a factor in the massive reduction of crime… and yet we waste money (and lives) on these ineffective and destructive policies that conservatives love so much. Maybe the reason Republicans hate government so much is because they’re so bad at it. The above video is an interview with Michael Morgan who was involved in a recent documentary about violence in media. I just finished watching the documentary. It’s well done, but I was already familiar with some of the general analysis because of other documentaries (such as: The Power of Nightmares). I wish such documentaries had wider viewing. The challenge is that media promoting violence sells better than media criticizing violence. My only criticism of this documentary was that it demonstrated the effect of violence in media, but it didn’t fully explore why the media focuses so much on violence. There is more to it than just the public likes violence and those producing media are simply seeking profit. I don’t think it’s accidental a world of fear is created by media of violence. Those in power (media owners and politicians) want a world where people live in fear and want a public that is divided because that maintains and increases their power. The mainstream media, as Chomsky and others have pointed out, follows a propaganda model. To be fair, the organization that put out this documentary has other videos touching upon this issue (see: The Myth of the Liberal Media: The Propaganda Model of News). This post is just my gathering some data and analysis about the changes in wages and various factors related to it. But first I want to put it in the context of wealth disparity. In some ways, average Americans are better off than in the past, but in many ways they are worse off. It’s hard to know if the good is greater than the bad. What is clear is that an increase of wealth disparity correlates to an increase of social problems. So, the increase in wealth disparity is definitely bad and even worse is that it was intentionally created. The debate over ending the Bush tax cuts for the rich sidesteps a serious problem. The issue is not just whether the wealthiest Americans should be taxed, but can they be taxed? The ultra rich have extraordinary means to engage in tax avoidance and evasion that ordinary citizens do not. In the first decades after World War II, the richest Americans began paying large fees to armies of professionals whose sole task was to help them avoid taxes. By the 1960s, an entire Income Defense Industry had arisen to satisfy this demand. It has grown more sophisticated and effective with each passing decade. The industry lobbies key committees in Congress, quietly inserts provisions in a tax code only top attorneys in the industry comprehend, structures complex partnerships and tax shelters few auditors at the IRS can disentangle, and often uses these instruments to move wealth and income offshore. All of this is done off the political radar screen and there is no countervailing lobby or parallel income defense industry for the average Joe. The few public interest organizations arguing for “tax justice” on behalf of average citizens are vastly out-staffed and out-funded. The Senate estimates that the industry helps the wealthiest Americans avoid paying nearly $70 billion in taxes a year through “abusive offshore tax avoidance schemes” alone. The number is much higher if corporations are included. [ . . . ] The ultra rich who avoid and evade taxes in this way face almost zero legal risk and reap huge savings. No matter how massive the tax fraud perpetrated, the wealthy taxpayer is shielded behind a phalanx of Income Defense Industry professionals paid to devise the schemes. In the notorious KPMG case settled in 2007, it was the firm that was fined for the fraudulent “tax products” it provided to ultra rich clients, many of whom had the chutzpah to turn around and sue KPMG for selling them inferior tax shelters after they had to pay hundreds of millions in back taxes and penalties. Average taxpayers are far more likely to be held criminally liable for tax evasion than ultra rich citizens who have the resources to litigate for years. They hire lawyers in the same Income Defense Industry to intimidate IRS auditors and legal teams. The IRS manual instructs staff to weigh the “necessary expense” as well as the “expected hazards of litigating the case” when considering cutting quiet deals out of court with big tax cheats. Re-imposing the Bush tax cuts on the top 2 percent of income earners creates the mistaken impression that the richest of the rich will finally have to shoulder a fairer share of the tax burden. But those at the very top will not. The vast majority of Americans in that top 2 percent are what the wealth management industry calls the “mass affluent,” a segment of the market they do not serve because households earning a few hundred thousand a year up to a couple million cannot afford tax letters, shelters, or the costs of restructuring assets and moving income flows offshore. These are the doctors, lawyers, and other professionals who are not only in the top tax bracket, but actually have to pay the rate of their bracket — something the ultra rich never do. In 1992, the top 400 income earners paid 85 percent of the published bracket income tax rate. By 2007 their effective tax rate had dropped below 50 percent. Ironically, many of the mass affluent professionals in the top 2 percent earn their comfortable incomes through fees they get helping the richest 150,000 Americans above them keep tens of billions in unpaid taxes each year. [ . . . ] His concern is what the concentration of wealth means for American society in the future. He said he wondered whether the post-World War II era in America — as defined by prosperity and rising income levels — was a historical anomaly and was coming to an end. The data we present here reveal that, for the period 1979-2000, married-couple families with children increased their hours worked by 16 percent, or almost 500 annual hours. Yet the data also demonstrate that without the increase in women’s work, middle-quintile families would have experienced an average real income increase of only 5 percent — instead of the actual 24 percent — while families in the bottom two quintiles would have experienced a decrease in real income over that period — by about 14 percent for the bottom quintile and about 5 percent for the second quintile. These data reveal that the economic engine for middle- and lower-income advancement is in low gear. Remarkably, this is true even when productivity has grown at a healthy clip. These trends represent a departure from those of the post-War years when median family income doubled — tracking productivity growth. Today, middle- and lower-income families no longer see increasing returns to their hours worked in the same way that the previous generation did. The only way many of these families can keep their total income growing — or not shrinking — is to work harder and harder. For the complete document, please see the attached PDF version. Here’s my capsule view of the great financial meltdown of 2008: For the past couple of decades, the benefits of economic growth have gone almost entirely to the rich. But the middle class still wanted to prosper, so the rich loaned them money to continually improve their lifestyles. That worked for a while. And then it didn’t. [ . . . ] Growth in a modern mixed economy2 is fundamentally based on consumer spending, and middle class consumers can increase their spending in only three ways: (1) real wage growth, (2) borrowing, or (3) drawing down savings. Only the first is sustainable. So if we want the American economy to grow consistently over long periods, we have to focus our economic machinery on median wage growth. We’ve done it before, we can do it again if we’re smart, and the result would be good for everyone: the rich would get richer, the middle class would get richer, and the poor would get less poor. The alternative is booms, busts, and continued social erosion. In a new book he is working on, entitled “Fault Lines,” Rajan argues that the initial causes of the breakdown were stagnant wages and rising inequality. With the purchasing power of many middle-class households lagging behind the cost of living, there was an urgent demand for credit. The financial industry, with encouragement from the government, responded by supplying home-equity loans, subprime mortgages, and auto loans. (Notwithstanding the government’s involvement, this is ultimately a traditional Chicago argument: in response to changing economic circumstances, the free market provided financial products that people wanted.) The side effects of unrestrained credit growth turned out to be devastating-a possibility that most economists had failed to consider. I didn’t expect to read that line of thought from Rajan. I’ve talked about this before, both housing equity as the new social contract, as well as the way excessive debt smoothed out the high-risk income-trapped structure of current families. Rather than focusing on how nice of a refrigerator the poorest can buy, it might be worthwhile to look at how inequality has played out in the middle-and-working classes here (which ultimately effects mobility among the poorest too). I’m curious as to the drivers he finds between inequality and a middle-and-working-class squeeze. Spending on housing and education are the obvious ones. [ . . . ] Economists offer various reasons for the stagnation of wages. Although the economy continues to add jobs, global trade, immigration, layoffs and technology — as well as the insecurity caused by them — appear to have eroded workers’ bargaining power. 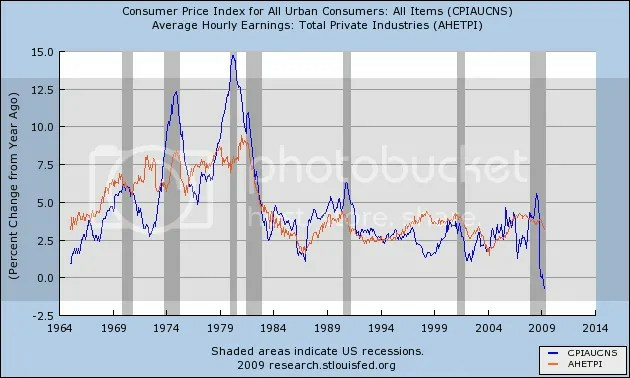 As you can easily see, real wage growth essentially stagnated in 1974, and ever since the Reagan revolution, almost all growth from productivity has been vacuumed up by the very top of the income scale. Americans have somehow survived despite this stagnation by resorting to a small bag of budgeting tricks. But now, with one possible exception, those tricks aren’t going to work any more. 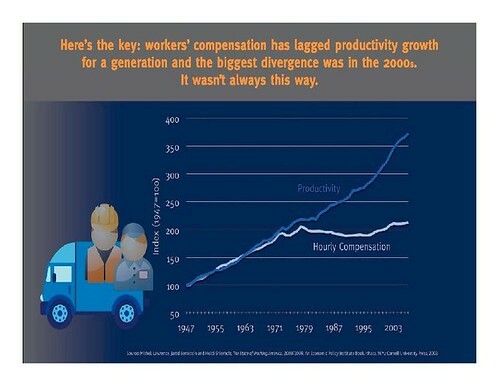 Simply put, from here on in, we’re not going to have any sustained economic growth until real wages finally grow too. I’ll show you why, below. – to refinance their existing debt at lower interest rates. When consumers were unable to do either of those things, they cut back on spending, triggering consumer-led recessions. Since 1980, this confluence of negative factors had only happened twice: in the deep Reagan recession of 1981-82, and again briefly from July 1990 to March 1991. That last conclusion was certainly proven correct! With a declining 401k value, crashing house prices, increasing Oil-fed inflation, and paltry wage gains, the recession started just a few months later in December 2007. [ . . . ] is this one of those “your wages won’t increase but Wal-mart has very cheap goods so feel rich” arguments? If you are like me and view money as something that buys both consumption goods and autonomy in a liberal capitalist democracy, then the consumption good deflator only covers half the reason of why a worker values getting a dollar after a day of work. It is true that much (but not all)* of household income gain can be attributed to wives working more, but neopopulists see the increased female workload in an entirely negative context and as a burden on women and families. We suspect many working women want to work…. * If the working hours of wives are held constant at 1979 levels, median incomes at the 50th percentile for prime-age couple households would still have risen by 9 percent in real dollars from 1979 to 2004. For households at the 70th percentile, the increase would be 22 percent. I’m happy many more women are in the workforce. But if the real driver of household wage growth is simply that households are working more hours, then that isn’t exactly wage growth. “I want to make more money so I doubled my shifts” isn’t really the same statement as “they are paying me more money.” Winship points out male wages have increased around 8% over a 35 year period, for an annual growth rate of 0.23%. Something eventually had to give: maxed out at capacity, both in the number of hours in a day and the line of credit approved – if this was a firm, would you want to invest? I also wish to note that my analysis didn’t include real estate taxes and numerous other expenses that most folks have to pay. So even if you are extremely frugal and careful with your money, it is impossible to “get by” in the US without using credit cards, home equity lines of credit or burning through savings. The cost of living is simply TOO high relative to incomes. Basically, the basic bargain was roughly this–if you worked hard and became more productive, you would see that sweat of the brow in your wages. And from the post-war era until the 1970s, that deal basically held–as you can see from the lines that are basically close together until the 1970s. Then, the lines diverge–dramatically. You can see it yourself. If the lines had continued to track closely together as they did prior to the 1970s, the MINIMUM WAGE would be more than $19 an hour. THE MINIMUM WAGE!!! So, in short: people had no money coming in in their paychecks so they were forced to pay for their lives through credit–either plastic or drawing down equity from their homes. There are lots of reasons that this happened–greed, the attack against unions, de-regulation, dumb trade deals. But, the point is: we will never fix the economic crisis, whether through short-term economic stimulus and certainly not through tax cuts, until paychecks are re-inflated. Dramatically. I outlined a whole set of solutions to bailout American workers but the main one is simple: raise wages. Dramatically. And end–and I know some people cringe at the term–the class warfare that has been underway for the past three decades. I suspect modern individualism is a cultural artifact rather than being inherent to human﻿ nature. It was taken to an extreme with Western Civilization and in particular capitalism, but it seems to have it’s origins with the Axial Age. Julian Jaynes proposed the theory that earliest literature such as from the Greeks doesn’t show signs of individualism as we know it. Modern individualism is based on the idea of an objective world of objects, but early humans experienced the world animistically. I’ve noticed that the objective world of objects is particularly appealing to conservatives. Many conservatives use capitalism as a metaphor for﻿ all of life. They see life as a meritocracy where everything has to be earned. They see the fundamental fact of life is ownership where all the world can be owned and where people even own themselves and can sell themselves to the highest bidder. According to this view, anything that doesn’t have monetary value has no ‘objective’ value. I’ve been in a number of arguments with conservatives who believe individualism is the basis of all reality. Their ultimate argument is perceptual. They see a world of separate individual objects including humans, but they don’t seem to be able to see their own cultural biases. Many conservatives seem less aware of factors that are subjective and intersubjective which has always bewildered me. I’ll bring up social science research, but to﻿ many conservatives such research seems irrelevant or somehow missing the point. To me, it just makes sense. Even though I don’t think individualism is inherent to human nature, I do think there are psychological predispositions that make one more﻿ likely to accept the cultural biases of individualism. For example, Ernest Hartmann has done research on boundary types. Thick boundary types tend to experience the world in terms of separation: between themselves and others, between waking and sleeping, between past and present, etc. They have minds that tend to narrowly focus excluding everything outside of that focus. Conservatives tend to mistrust the subjective and the intersubjective, the abstract and the theoretical. They tend to trust what is practical,﻿ concrete and tangible. They tend to want fundamental truths and rules. The first video about individualism seemed to have some connection to another video I just watched. In the following video, UFOs are discussed in terms of perception of reality. Maybe part of the connection I sensed relates to Jung’s having written a book about UFOs in terms of mandalas as a symbol of the self. Jung saw UFOs, whether real or imaginary/imaginal, as being manifestations within human experience of a symbol of wholeness. This is part of Jung’s theory on individuation. Modernism has created an individual sense of self that is disconnected from the world. The fears brought on by globalization and world wars has forced a creative tension where the human psyche is seeking a new experience of wholeness. I have one last point. All of this isn’t just philosophizing about humans and society. There is obvious relevance to politics, economics, and environmentalism. The latter I pointed out in a post about capitalism having failed in the past in terms of taking into account the values and costs that aren’t easily measured by ‘objective’ and monetary standards. There are collective costs to modern civilization that require collective solutions. This isn’t idealistic. I just came across this next video which explains the practical potential of collaboration. The competitiveness of individualism is no longer working, if it ever did work, now that populations have become so large and concentrated and now that diverse societies have become so interrelated. Here is the type of news that gets a lot of attention because the media loves to report on the media. I don’t generally care about such things to any great extent, but I thought this might be an example of a difference between liberals and conservatives. I’ll share my commentary below the video. Of course, MSNBC has a policy and they have the right to suspend Keith Olbermann. It’s just like how NPR had an employee contract which was why they fired Juan Williams. It’s not surprising. Also, I’m sure there was more going on than just this. I doubt Olbermann was suspended or Williams fired just for one incident. MSNBC is within their rights to suspend Olbermann, but even so it doesn’t necessarily mean they should do so or that another organization would do so in the same type of situation. For example, I doubt Fox News would ever do the same thing. If Fox News management found out that Beck or O’Reilly were making contributions to Republicans, I doubt there would be any suspensions. This reminds me of how the Obama administration criticized the professional left, but as far as I know Bush never criticized the professional right. I’m not sure if this says anything about liberals in general or just mainstream liberals or mainstream liberal organizations. In both the cases of Olbermann and Williams, an employee didn’t toe the line… but the infraction in both cases was rather minor. Rightwingers have often criticized liberals as demanding politically correct conformity. I usually don’t give much credence to this criticism because conservatives are even more conformist in their own way, but there is something that makes liberal comformity different. Liberals don’t demand conformity in terms of a group mentality per se. Conservatives are much more concerned or at least more strict than liberals about conformity to in-group norms (which psychological research confirms), but liberals seem more bothered by social rules that apply to all rather than merely the particular in-group. Olbermann’s giving money to Democrats seems unfair since he plays the role of a journalist, although I’d argue he is a pundit like Bill O’Reilly. Liberals seem to care a lot about journalist ethics. However, conservatives, like Fox News management, don’t seem to care as much about whether their news reporting is actually fair and balanced. What matters at Fox News is the claim and not the reality of fair and balanced. Most news media is moderate and centrist in terms of serving mainstream interests, but Fox News is the mainstream media news outlet that is most conservative and MSNBC is the mainstream media news outlet that is most liberal. Even so, between Fox News and MSNBC, a further distinction can be made besides mere direction of bias. Fox News donates a lot of money to Republicans, but MSNBC supposedly donates equally to both Republicans and Democrats. Isn’t that interesting? If MSNBC is the furthest left of mainstream media, why are they more fair and balanced in their donations than the far right Fox News? So, MSNBC had a policy about not being overtly partisan such as with donations and so Olbermann was seen as tarnishing their reputation. Fox News wouldn’t be bothered by one of their pundits donating to Republicans since donating to Republicans is the policy of Fox News. I noticed one other video that caught my attention. One thing that distinguishes Fox News from all other news outlets is that their pundits actively promote political movements and political candidates. Fox News along with the Koch brothers took over the Tea Party and made it what it now is. MSNBC looks centrist in comparison. MSNBC management doesn’t want to be seen as just a liberal network, but Fox News is more than happy to work for the GOP (or, as one particular conservative suspected, to have the GOP in their pocket). I don’t know exactly what all of this means, but it does seem like an important difference. NBC policy does not prohibit employees from donating to political candidates — but MSNBC president Phil Griffin is miffed that Keith didn’t get “prior approval’ first. Meanwhile, Republicans Joe Scarborough and Pat Buchanan also gave political contributions — but are not suspended. We’ve had enough insanity this week — we don’t need more because Phil Griffin’s feelings are hurt. That changes the context entirely. From the initial reporting, I was made to believe NBC does have such a policy, but it now appears they don’t. So, the suspension of Olbermann was a personal decision of the MSNBC president and not a defense of an official standard of employment. This makes the whole incident even more strange. I was suspecting there was more going on behind the scenes. First we declare corporations “persons” and political donations “free speech”. Then coorporations declare that people working for them need coorporate permision to make political donations even when there has been no conflict of interest. To make this more interesting, Comcast bought NBC. Why this is interesting is that supposedly Comcast’s CEO (and his wife) are major Republican donors. It just gets more and more interesting. When you find a scandal, just follow the money. It’s great — read it! Then join 60,000 others in signing the national congrats card to Keith! I want to sincerely thank you for the honor of your extraordinary and ground-rattling support. Your efforts have been integral to the remedying of these recent events, and the results should remind us of the power of individuals spontaneously acting together to correct injustices great or small. …I also wish to apologize to you viewers for having precipitated such anxiety and unnecessary drama. You should know that I mistakenly violated an inconsistently applied rule – which I previously knew nothing about — that pertains to the process by which such political contributions are approved by NBC. Certainly this mistake merited a form of public acknowledgment and/or internal warning, and an on-air discussion about the merits of limitations on such campaign contributions by all employees of news organizations. Instead, after my representative was assured that no suspension was contemplated, I was suspended without a hearing, and learned of that suspension through the media. When a website contacted NBC about one of the donations, I immediately volunteered that there were in fact three of them; and contrary to much of the subsequent reporting, I immediately volunteered to explain all this, on-air and off, in the fashionMSNBC desired. I genuinely look forward to rejoining you on Countdown on Tuesday, to begin the repayment of your latest display of support and loyalty – support and loyalty that is truly mutual. Do you admire this man? Tell him! Join 60,000 others in signing the national congrats card to Keith, which we’ll deliver to him. Click here. Thanks for being part of this successful campaign and for being a bold progressive. Here is the type of information we’d regularly see in the US mainstream media if it wasn’t controlled by corporate interests, the same corporate interests that control our government. Otto Reich worked for the Office of Public Diplomacy which was created during Reagan’s administration. You remember Reagan… the guy rightwingers idolize for being the greatest defender of freedom. Don’t listen to those lies about the Iran-Contra affair. This is the most interesting video I’ve seen about Julian Assange. It offers a lot of context to understand the motivations of and political machinations surrounding his work.